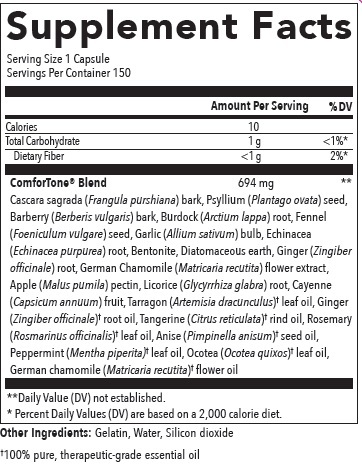 ComforTone Capsules | Got Oils? Take 1 capsule 3 times daily. Drink at least 64 ounces ofdistilled water throughout the day for best results. This product contains Cascara sagrada bark. Read and followdirections carefully. Women who are pregnant or nursing and otherswho have a medical condition should not use this product exceptunder the direction of a physician. Children under 12 should notuse this product. Discontinue use and consult a physician if youhave or develop abdominal pain, diarrhea, nausea, or vomiting. Donot exceed recommended dosage. Not for long term use. Not to beused as a weight loss product. Keep in a cool dry place. Do not expose to excessive heat ordirect sunlight. Keep out of reach of children.